Wow, it is 2017 already. Evernote has been one of those apps that I will never be able to do away with when it comes to note-taking and organizing my work. Here is my list of best tips and tricks for Evernote. Evernote is not just a note taking app. This claim is true to the core - “For everything you’ll do, Evernote is the workspace to get it done.” It lets you organise all your information from mails, thoughts to audio notes across all your devices. From busy professionals to homemakers, Evernote is your safest bet to declutter and organise your life. The way Evernote is perceived varies from person to person. 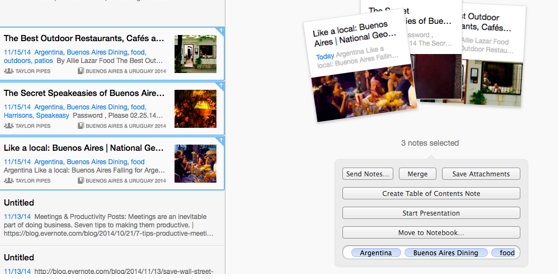 A few users use it as a basic note taking app, whereas others treat it as a to-do list app. Use Evernote with its other official and third party apps to get more done. It is surprising enough to see such a diverse use of a single app. If you have been using Evernote for quite a some time then you might want to see if there is any new way in which Evernote can help you become more productive in 2015! Exchanging of business cards is a common gesture when you meet a new person. During events and meetups you end up with a thick bunch of cards. These cards take up physical space and it gets difficult to organise them with time. Use Evernote to scan these cards and organise them efficiently. In fact, Evernote goes a step further and syncs data from LinkedIn as well. All the business cards are saved in a separate notebook and you can choose to tag each one of them based on your choice. Augment is a nifty chrome plugin which lets you manage multiple apps straight from Gmail. It syncs with Evernote flawlessly. You can push a complete email to a notebook of your choice. Or could mae notes from Gmail without having to switch tabs. This plugin replaces the Evernote feature of having to send the email to a notebook by forwarding it to your personalised email. We get a lot of promotional and informational newsletters. Though we might not find it useful every single time, we would still like to keep them handy. Hence we do not unsubscribe from these services. Use this recipe from IFTTT to automatically send your newsletters to a notebook for future reference. Pro tip: You can setup the same recipe in IFTTT to help you organise your receipts and bills. If you are the kind of person who lives in his calendar, then this tip will do wonders. Sync Evernote and Sunrise. You can add reminders from either of the two apps and it will reflect on both. Important to-dos and events will never be missed again. Evernote web clipper is a very useful tool for people who browse the internet a lot. It lets you clip text, image and articles from any website straight to your Evernote. It comes handy during research for your next blog or even for assignments. Clip anything that you find interesting and the best part is that it is accessible across all your devices. It is exactly like Pocket, only much better! Organise a structure for your notes using tags and notebooks. Form tags that are reusable and help you define a context. Evernote supports 3 types of tags: Personal, Business and Shared. You can create multiple tags under each of this category. Tags and notebooks are specially helpful when you have to search through all your data. Pro Tip: Use nested tags to organise more efficiently. You can click a picture of your handwriting and store it directly in Evernote. Also, in Android phones and Tablets you can actually write in Evernote and save it. It is helpful when you have to save your hand written notes. Audio notes can be helpful during meetings, lectures or during speeches. They function similarly as a regular note with tags and can even be classified into notebooks. While working on something you tend to make multiple notes on the same topic. Evernote simplifies the task by allowing you to merge multiple notes. This feature works on desktops as well as on mobile apps. Just select the notes that you want to merge and click on ‘merge’. It is that simple! Merging notes is one of the features that led to us adding Evernote to our best business travel apps list. Add an extra layer of security with the two-step authentication. It is advisable to use this feature to protect sensitive or personal data. After switching on the two-step verification you would require to enter your password and also a passcode from your phone. Thanks to image and handwriting notes, you get to collect and sort anything from meeting minutes to classroom lectures. But what if you have find them? Fret not, Evernote searches through these images as well. 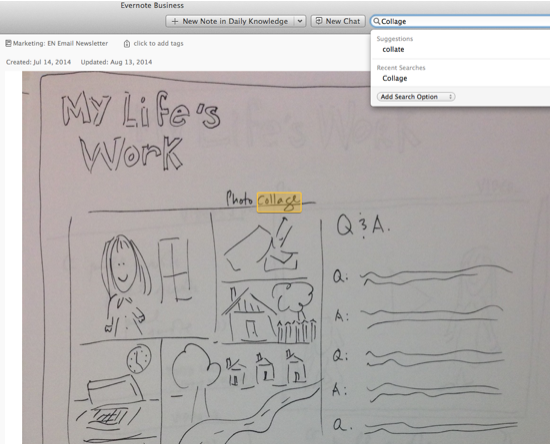 Search as usual and Evernote includes the images and handwritten notes in the results. Yes, it is that awesome.